'The World Speaks' In Response To Sept. 11 Lee Ielpi, a retired New York City firefighter who lost his son on Sept. 11, 2001, is co-founder of the Tribute WTC Visitors Center at ground zero. The center, which celebrates the lives of the victims, has collected reflections of visitors in a new book. 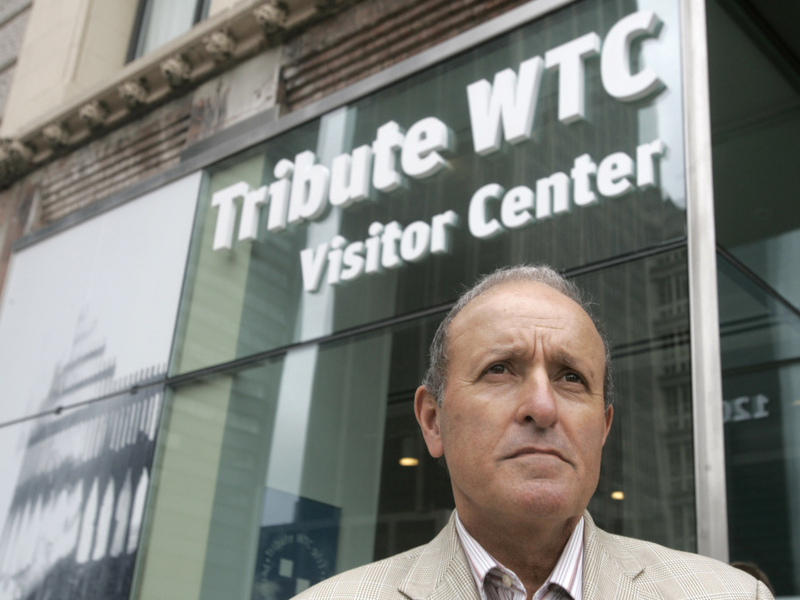 Lee Ielpi is president of the September 11th Families' Association, which opened the Tribute WTC Visitor Center in 2006. Construction is still under way at ground zero, the site of the Sept. 11, 2001, attacks in New York. A memorial plaza is set to open a week from Sunday, 10 years after the attacks on the World Trade Center buildings. Amid the bulldozers and cranes, there are newly planted oak trees. Workers are putting the finishing touches on the two massive waterfalls that will flow into the foundations where the towers once stood. The official museum won't be ready until 2012. The only place where visitors to the neighborhood can learn about the events of that day — at least for now — is at a little storefront on Liberty Street. While the museum across the street was mired in politics, the September 11th Families' Association opened the Tribute WTC Visitors Center a few years ago. "My entire life has been fire, I love firefighting. I volunteer in my hometown," says Lee Ielpi, a retired New York City firefighter and president of the association. "I like that rough-and-tumble idea. I like helping people." With his thinning hairline and strong nose, Ielpi, 67, looks a little like former New York Mayor Rudy Giuliani — in fact, tourists sometimes stop him for photos. He doesn't seem so rough-and-tumble from the easy way his handshake moves into a hug, or from the way his voice drops a little midsentence, like he's sharing secret. For Ielpi the journey to the center began 10 years ago, on Sept. 11. "I was at home having a cup of coffee and the phone rang," he says. It was his eldest son, Jonathan, also a New York firefighter. He told his dad to turn on the TV. Ielpi asked if his son was going, and he said they were "checking." "Within that instant, you could hear that tone in the background, which means they were going out on a run," Ielpi says. "So he said, 'Dad, it's for us, we're going to the World Trade Center.' I said, 'OK, buddy, be careful.' He said, 'OK, Dad,' and that's the last time we spoke." Shortly after that call, Ielpi headed down to ground zero. "My mission was simple, even though I'm retired. I was going to come into the city and stay on the periphery and help," he says. "Getting through this city, realizing now that the two towers have collapsed, knowing it was a terrorist attack, my mission was a little different ... 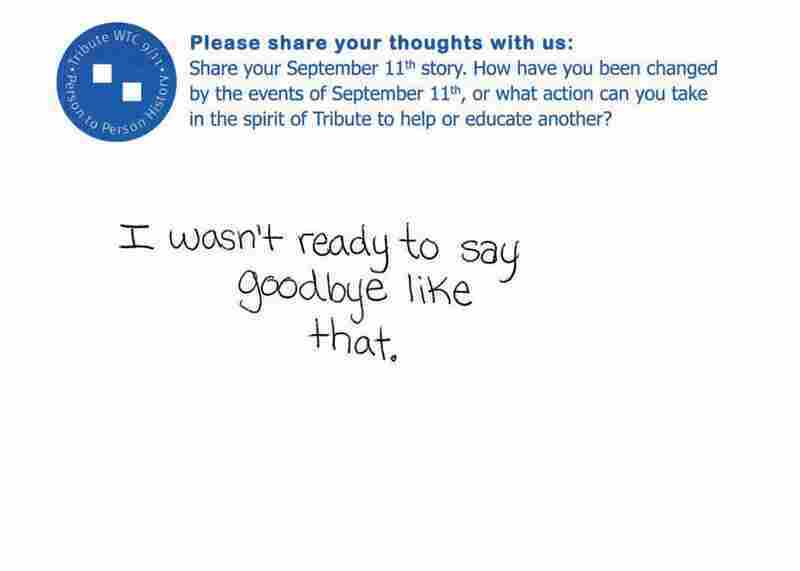 I wanted to make sure my son was OK, and then I would continue to help. It didn't take long before you could see into the site and realize this was going to be a very bad day for a lot of people." Day turned into night, night into a week, a week into months. The emergency response mission turned to one of recovery. The Tribute WTC Visitor Center has collected the reflections of 200,000 people from 120 different countries. It has published many of those reflections in a new book, 9/11: The World Speaks. 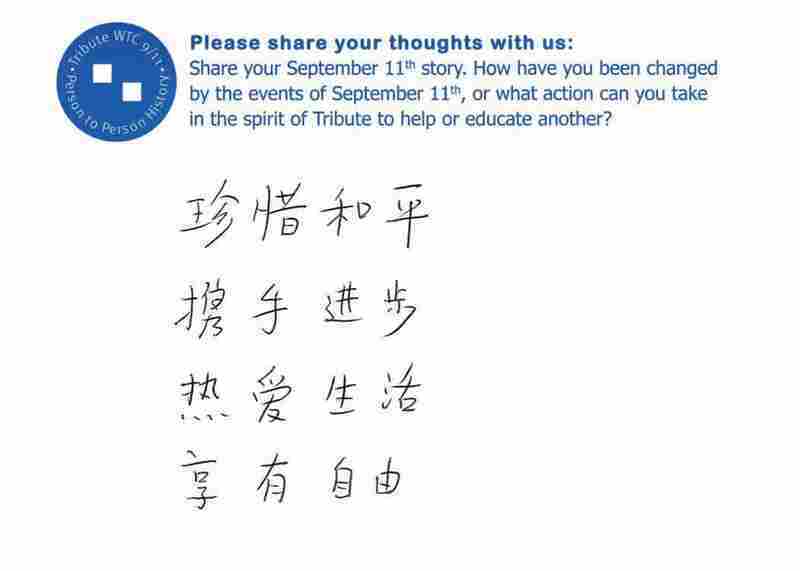 Excerpted from "9/11: The World Speaks" by Lee Ielpi and the Tribute WTC Visitor Center. Copyright 2011 by Tribute WTC Visitor Center. Reprinted by permission of Lyons Press. "Treasure Peace/ Hold Hands and Go Forward/ Love Life/ Enjoy Freedom." China, page 57. "Steel is not the greatest metal in the world — the human spirit is." Illinois, page 86. "Which religion on this earth teaches us to kill humans?" India, page 157. Ten years later, Ielpi is still here, telling his story. As co-founder of the Tribute Center, he sometimes still gives tours. Glass cases perch on the walls of each gallery. 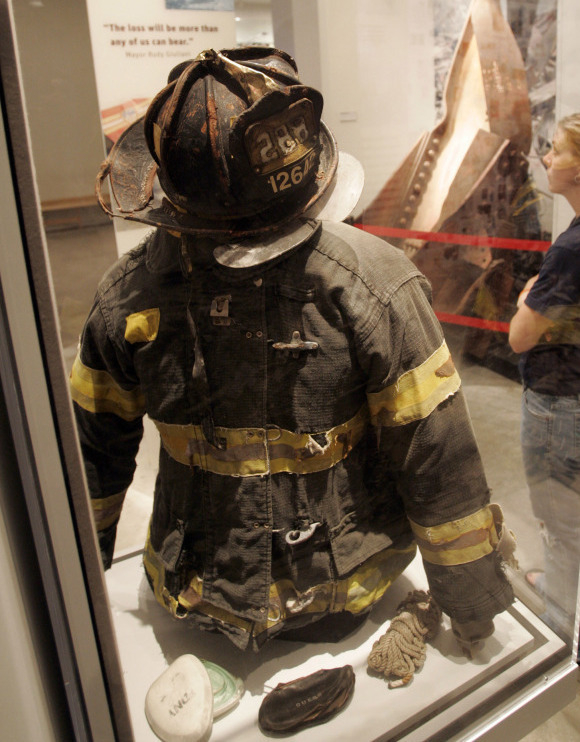 Bit by bit, they reveal the stories found buried in the rubble of ground zero. Ielpi says "one of the more powerful pieces" on display is a window. "It's a window of one of the jets that struck one of the towers. It is the window you look out, it's as if you're on the inside of the jet looking out our window," he says. Many of the pieces were donated by relatives of those who died, others by the agencies and recovery workers who spent months amid the ruins. Ielpi donated to the museum, too. He worked for all nine months of the recovery mission, alongside fellow firefighters and other fathers looking for their sons. It would be three months to the day after the towers fell that he got word of Jonathan. "I was sitting at home, 11:30 p.m. the phone rang," Ielpi says. "It was the chief in charge of the site for the night. And all he said was, 'Lee, we have Jon.'" He went to the site around 1 a.m. with his other son, Brendan, who wa also a firefighter then. "In the tradition of the N.Y. Fire Department, we carry out our own. So my son Jonathan was in a stokes basket with a flag over him," Ielpi says. "So I went over and did what I had to do to my son. Brendan went over and did what he had to do to my brother. Then myself and Brendan and some men from Squad 288 picked up Jonathan and carried him out of the site. So we were blessed — Jonathan is one of the 174 whole bodies, what is considered a whole body." About a week after they found Jonathan's body, they found his turnout coat, and about a week after that, they found his helmet. The helmet was battered and blackened. The right side of his black and gold fireman's jacket is torn. Both items now sit in a glass case at the heart of the Tribute Center galleries. The helmet and jacket of Ielpi's son Jonathan are on display at the Tribute WTC Visitor Center. Ielpi says he doesn't regret having his son's turncoat on display. "Do you know how many people have taken pictures of my son's turncoat, worldwide?" he says. "It's a difficult place to go, but my son is around the world, and if people want to use my son as a remembrance of understanding the sacrifices that were made that day, by many, many people not just firemen, well my son is serving another mission now, isn't he? A good mission." The real mission of the museum is to celebrate the lives of the victims, honor their families and share in what they can teach. There are no references to the breakdowns in first-responder radio systems, of the hijackers or the politics of the wars that followed. Nowhere is the message clearer than in one of the final galleries, where there is a floor-to-ceiling, wall-to-wall collage of mementos of those who were lost. There are home photos, school pictures, baseball caps, handwritten notes and even a death certificate marked "homicide" — all donated by families of Sept. 11 victims. 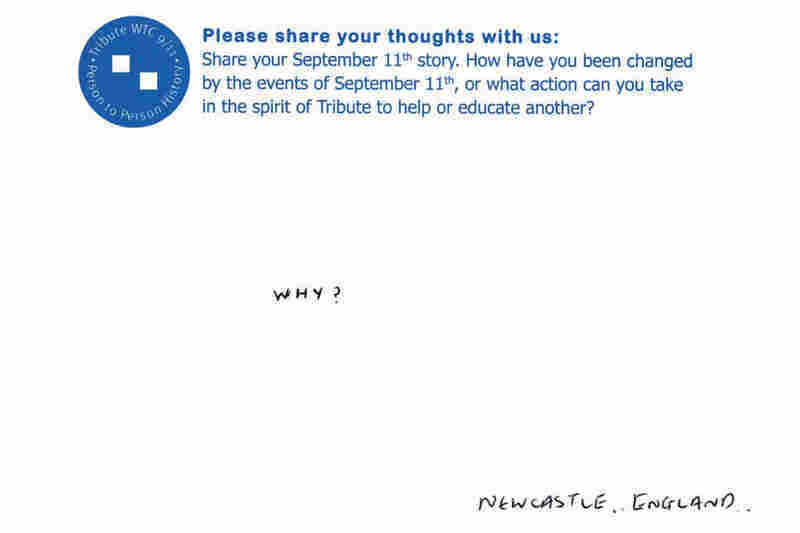 A collection of the comment cards left at the center with the memories, reactions and appreciations from visitors is being released in a book called 9/11: The World Speaks. What started as a temporary memorial to fill the gap while the official memorials were built, now has a life of its own. For all these years, Ielpi has had this role as a voice for families of the victims, and he says it hasn't been easy. "Everyday is difficult to talk about my son and all the beautiful people that I lost that day — maybe 80, 100 good friends. But that keeps it real for me, and it keeps it real for you," he says. "So, everyday, I think about it. I want to start fishing again and hunting and hiking and camping. I will. But I think ... what we're doing here is more important."